We arrived in Agnes Water to pretty nasty weather, after warnings on the bus that we would get no further up the road until at least Monday! we had to try and sort out further trips, accommodation and buses. The cyclone that had hit further north had cancelled all buses from Thursday to Monday in the areas we here heading to next......After managing to rearrange everything with not much hassle, we set about making the most of our time in Agnes Water, we were now spending five nights here. Finding much to do here was rather difficult, especially with the torrential rain.....The beach was lovely, but the rain was not for walking in. Luckily we managed to do our scooteroo tour, which was cancelled the day we were meant to do it. The scooteroo tour was fantastic. The company have choppers made to look like Harley Davidsons. 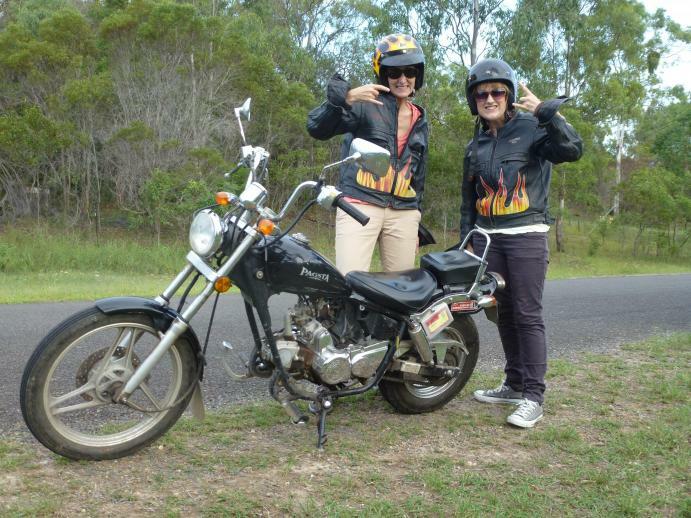 we got dressed in our leather jackets, helmets and tattoos and set off through Agnes Water's back roads, where we saw lots of kangaroos in the wild. At the end of the four hour tour we took a ride up to Agnes Water then back to where we started. Myself and Allena thoroughly enjoyed the tour and would high recommend it. The feeling of being on the bike on the open road was amazing. If it wasn't for the location, which I would probably not return to, it would be worth the 75 dollars to do it again. As for Agnes Water, small and nice, but not somewhere I would rush back to. however it was nice just to relax for a few days and avoid the horrid weather further up.......We got ready on our final day for another overnight bus to Airlie Beach, where we would be heading to the Whitsundays from.